Mac “System” taking up too much space in macOS High Sierra or Mojave? here are some free methods to clear the huge “System” storage on your Mac. Hi Mac Users, System is taking an incredibly large amount of space. I mistakenly loaded heavy video files to Numbers and the hard disk immediately filled up. Any help accorded will be highly appreciated. 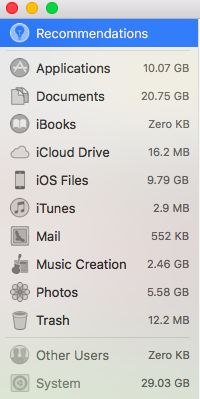 After I checked my computer storage usage and I was surprised to find my “System” is also taking an incredibly huge space – 43GB of the total 120GB on my MacBook Air. As well known, the Mac operating system usually takes up from 8GB to 13GB. So I don’t think my Mac “System” storage could be that huge, so I searched to find how it defines “System” storage for a Mac, and how to free up that storage. What is in Mac “System” Storage? How to Clean Storage on Mac? The “System” on your Mac storage bar stands for that space your macOS operating system used, including the system itself and the caches and cookies it generated while driving on your computer hard drive. Sometimes, your Mac may mistakenly put other sections into the “System” storage. For instance, my mac made the mistake of failing to exclude the “Music creations” and “iOS files” (iOS backups) from the “System” storage, so that I get a huge “System” on the storage bar. And after I clicked the Manage.. button on the top left of the bar, it showed the real system storage was taking only 29.3 GB. And there were two new categories named “iOS files” and “Music creations” being separated. And the sum of the storage size of these three parts (System, Music Creation and iOS Files) is 43.38GB, equal to the size of my huge System storage I showed before on the storage bar. On the storage manager page, you’ll have a detailed view of all data types with the size it used. And you can choose any large category to have a clean. And below are some usual and free methods to free up your Mac storage. Delete useless iOS backup files, applications and documents. Transfer media files like photos, video, music, and iBooks to external disk drive or cloud. And then delete them. Empty your Trash bin get more free space. Remove your iPhone or iPad software updates on your Mac. Most of these methods aims to remove the larger files on your Mac to quickly free up your Mac storage. And if there is any question, please leave your comment below. Post Ratings: 3/5 stars - 4 votes in total. Lol, I just wanted to share my thoughts, and sorry for not helping you! I can’t uninstall some apps, they take a huge size on my macbook.